Ainu language is the language of Ainu people. The Ainu language was not a written language until the 19th century. Since then, it has been written in katakana or the Latin alphabet. 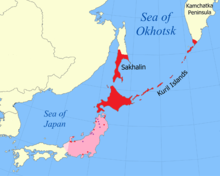 In the past, particularly in the 19th centuries, Ainu language was spoken in Ezo (including Hokkaidō Island and the southern part of Chishima Islands), the southern part of Karapto (Sakhalin) and the northern part of Chishima Islands (Kuril Islands). Ainu language has many dialects including Chitose, Saru, Karapto and others. Historically, Ainu people did not make a unified government, and then there has not been a standard Ainu language. The dialects are so different from each other that a speaker of one of the dialects cannot recognize what a speaker of another dialect said. Historically, Ainu language speakers were the neighbor of the speakers of Japanese language, Itelmen language and Nivkh language, which was spoken in the northern part of Sakhalin and considered to be an isolated language, too. Ainu has the SOV word order similarly to Japanese. Ainu phrases have left-branching structures. When telling about properties of a person or thing, the word of the property is said before it. The word ainu means "human being" and is the name used by Ainu people to refer to themselves. In contrast, kamuy means god, deity. Ainu people think that all of the existence who is supposed to have mind and plays a role in this world are kamuy. Each sparrows or standing tree is a kind of kamuy. In the Ainu people's perspective of the world, all goes well and human being can also be happy only when ainu and kamuy give a profit each other. Most of linguists think the numeral system of Ainu language base on twenty. Iyomante - A festival to send bear's soul for the heaven. Sumari - (be pronounced as in "Shumari") - fox. Huci - (be pronounced as in "Hoochi") - grandmother, Old women. ↑ Ainu language at Ethnologue (8th ed., 1974). Note: Data may come from an earlier edition. ↑ 4.0 4.1 4.2 Nakagawa 2013, pp. 8-11. ↑ 公益社団法人北海道アイヌ協会 (ed.). "アイヌ民族の概説 (general information of ethnic Ainu)" (PDF). Retrieved 2016-09-22. ↑ 6.0 6.1 6.2 6.3 Nakagawa 2013, pp. 26-27. ↑ Murasaki, Kyoko (2009-03-08). "Numerals in the Sakhalin Dialect of Ainu". Retrieved 2016-09-23. ↑ Nakagawa 2013, pp. 100-107. ↑ Stolz, Christel (2015-03-10). Christel Stolz (ed.). Language Empires in Comparative Perspective. Walter de Gruyter GmbH & Co KG. p. 167. ISBN 978-3-11-040836-2. Retrieved 2016-09-22. Nakagawa, Yutaka (2013-12-05). ニューエクスフレス アイヌ語. 白水社. ISBN 978-4-560-08639-1. This page was last changed on 9 July 2018, at 13:18.